A friend of mine asked me the other day for tips about flying a Bay Tour - an aerial tour of San Francisco and the surrounding area. I've done it so many times that it's routine, including all the things ATC can do to make it more challenging. But it's true that if you've never done it, it's pretty daunting. I was lucky since, flying out of Palo Alto as a student and ever since, I got to practice it all with my instructor. There are some articles on the web about it, but they all seem to leave out some of the wrinkles you may need. First, what is a Bay Tour? There is no "official" definition. If you tell Norcal you want a Bay Tour, they'll assume you're going to fly from wherever you are to downtown San Francisco, taking in the Golden Gate bridge and Alcatraz somehow along the way, then loop back in the same general direction as where you came from. There are no official routes (except generally-used transitions through the SFO Class B). You can fly over downtown San Francisco and the Golden Gate without talking to anyone, but that doesn't make it a good idea. For one thing there is often a lot of traffic, especially if it's a nice day. And you'll be a bit constrained as to what you do afterwards. You can certainly do it without transitioning the SFO Class B, if that makes you uncomfortable, by crossing the bay and transitioning Oakland instead. 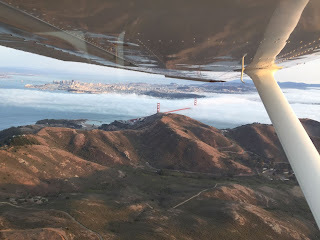 Starting from Palo Alto, I like to fly across the hills to the coast and fly up towards and over Half Moon Bay, before crossing the bridge, looping round Alcatraz, fly over the city then transition past SFO and back home. If the light is especially pretty, I'll do a loop around the bridge, Sausalito and the Marin headlands, and maybe another over the city. That takes 50 minutes or so and has been much appreciated by many, many visitors and friends. Alternatively, it's possible to do the SFO transition outbound, or even both ways. If the coast is socked in, this is the best way. I'll talk about both. There's nothing scary about the Class B transition, but you need to have a good radio technique. If you sound hesitant or the controller feels there's any risk that you won't do as you're told, all you get is "remain clear of Class Bravo." You'll be mixing it with airliner traffic at one of the busier airports in the country, in a very complex airspace. The last thing anyone wants is to have to divert a jet with 500 people on it, just because some Cessna driver gets confused. A few years ago there was a conflict between a departing 747 and a Bay Tour, which made it into the newspapers. There was never any danger, but not surprisingly it has made the SFO controllers a lot more careful. Before you even get to the airport, you'll want to check the weather. It's best on a perfectly clear, cloud-free day, but you can't count on that, especially if you have visitors who aren't here for long, so you may need to compromise. If the ceiling is anything above 4000, you can do everything described here, though the pictures won't be as pretty. Often there's an overcast along the coast. The city of San Francisco is notorious for its micro-climates, so you can have heavy overcast at the coast, yet brilliant sunshine a mile inland. Webcams can be helpful in planning all this. So... let's suppose you're taking off from PAO, or arriving from somewhere further south, and you want to fly the "Bayshore transition" northbound towards the city. From PAO, you'll ask for a "straight out departure for Bay Tour". They may come back and say "SFO is not accepting transitions at this time." In that case there's another technique, which I'll come to later. But let's suppose they are OK with it. On takeoff, you'll fly just to the west of 101 (aka the Bayshore Freeway, though I don't think anyone who isn't in ATC has called it that for decades). You'll fly at 1500 feet or so, and get handed off to San Carlos tower (119.0). They in turn will hand you off to SFO tower (120.5), and direct you to remain clear of Class B. That's a tricky bit, because you don't have much time to get a word in edgeways with them and get clearance into Class B. You have to be prepared to do 360s in the fairly narrow space between SQL's airspace and the to-ground part of the Class B, while trying to talk to SFO tower. Visually, the latter starts just beyond the San Mateo bridge, so it's easy to stay clear. Eventually, you'll hear the magic words "cleared into Class Bravo", along with an altitude (usually 1500 or 2000) and "remain south and west of the Bayshore Freeway". Now you can potter northwards while your passengers gasp with amazement as you pass almost within touching distance of the 777s and 380s on the ground. The normal runway usage at SFO is 1L/R for takeoff, and 28L/R for landing. There is no conflict with this. However really heavy planes (i.e. those going to Asia and Europe) use 28L/R for takeoff. If one of these departures is happening, you'll either be told to remain clear, i.e. to continue to fly circles just before the bridge, or given some kind of hold, typically a left 360. Very occasionally, you may be directed to fly mid-field over the airport - which is pretty amazing to do. 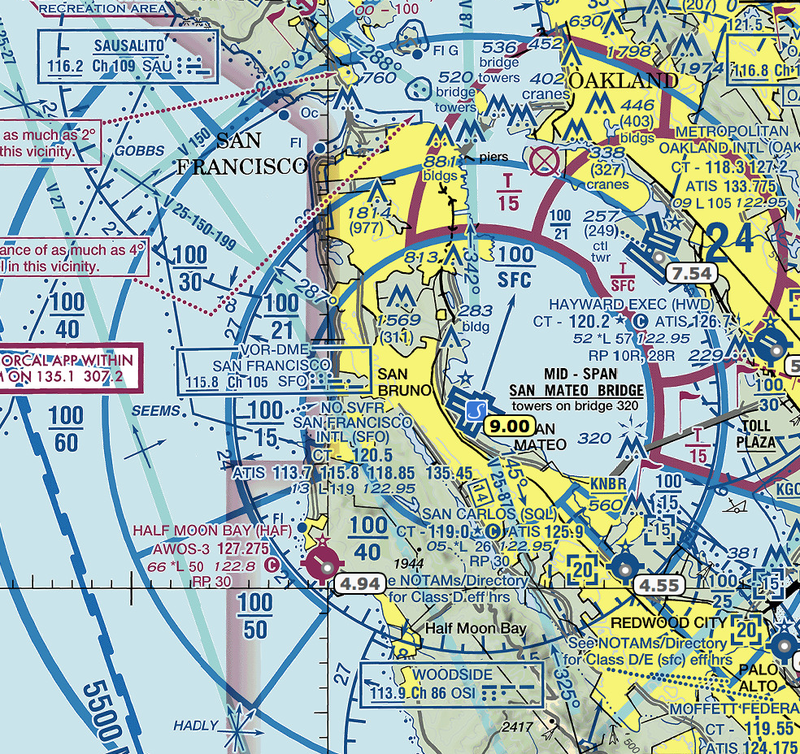 Once you're well clear of the 28 runways, you'll be told "own nav" and handed off to Norcal (135.1). There can be a lot of traffic over the city - tourists like yourself as well as sightseeing flights including the helicopter and a seaplane which operates out of Moss Beach. Norcal will call traffic but they may not be talking to everyone so you need to be really eagle-eyed. It's up to you what you do now. I generally fly at 2000, which gives me an out at least to get to water if the engine stops. It also keeps you legal over the downtown area (remember, 1000 feet above the highest point within 2000 feet). You can fly a circle or two over downtown, head out around Alcatraz, then over to the Golden Gate bridge and maybe a circle there. Now for the alternative. If you come from further south, you'll typically be higher (3500 or so) and talking to Norcal on 135.65, the SFO approach frequency. You'll never talk to SFO tower. If you get told "transition not available", then this is what you need to do. So you ask PAO for a left Dumbarton departure with handoff to Norcal. Then, when you get handed off to 135.65, you ask for a Bayshore transition at 3500. Generally (I've never been refused in decent VFR conditions) they will clear you into Class Bravo and "climb and maintain 3500". They may tell you to fly over 280 rather than 101 - the difference is only a couple of miles. The advantage of being this high is that there is no possible conflict with departing airliners. As I mentioned, I prefer to fly over to the coast and overhead Half Moon Bay. For this you need to be on the KHAF CTAF (122.8). Unfortunately that frequency is shared with Watsonville and several other nearby airports, so it can get busy and squeally. Fly overhead KHAF at 1500, self-announcing and keeping a very careful eye out for arriving and departing traffic. You could go higher, but you'll need to be below 1500 feet in just a few miles, so there's no point. It's common to have a layer of cloud over the ocean and sometimes over the coast. Often, the tops are so low that you can safely and legally just fly over it. If not, you should not use this route. Or if you decide to take a look and see, be prepared to turn around and head back overhead 92 towards San Carlos, give them a call (119.0), and then proceed as described above. If you look at the SFO Terminal chart (and you had better study it pretty carefully), you'll see that there's a tiny segment carved out of the SFO surface zone off the coast at Pacifca, with a 1500 foot floor. This is so you can stay close to the coast while the notoriously under-powered Convair 440s take off from 28 at SFO. No, there haven't been any of those for several decades, but nobody has told the airspace designers. Modern jets are already comfortably at 3000 feet by the time they cross the coast. But anyway you have to stay below 1500 - I generally go for 1300 to be on the safe side. As you fly into this sliver of airspace, call Norcal on 135.1. This goes something like "Norcal approach, Cessna 12345 entering the Pacifica transition at 1400 for Bay Tour and return to Palo Alto." They will give you a squawk and say something like "remain clear of Class B, notify when you are ready to return to Palo Alto." You can do the whole thing at 1500 feet, but once clear of the Pacifica transition I prefer to climb to 2000, once again to stay for-sure legal and to give me better engine-out options. 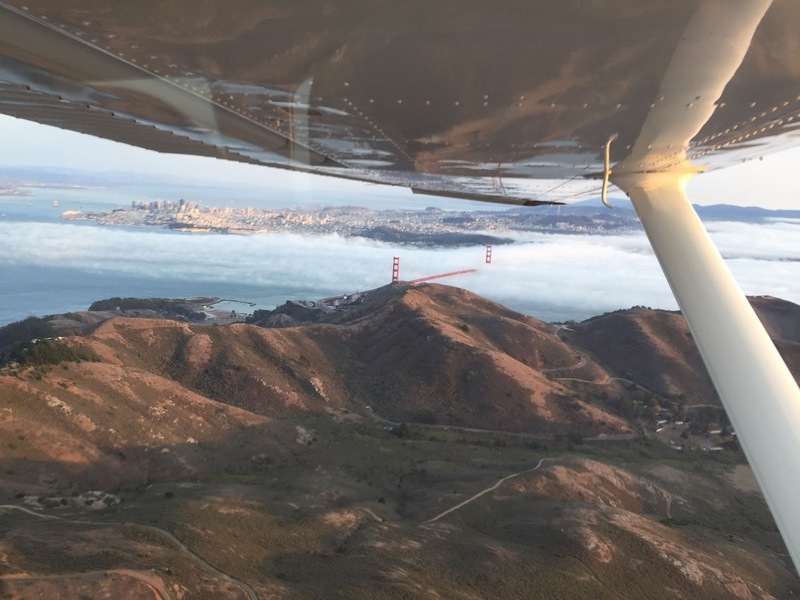 Flying over the Golden Gate bridge is a sure-fire passenger pleaser, and quite often I'll loop around to the left over Sausalito and back round over the Marin Headlands, to give them (and me) a second chance for the pictures. Once again, keep a very careful eye out for traffic. If it's a nice day (and why would you be doing this otherwise), there will be plenty. Eventually, you'll want to return. Stay tuned to 135.1 the whole time, but don't call anyone until you've finished flying in circles and ready to head straight back. Then call Norcal and say "request Bayshore transition for return to Palo Alto [or wherever]". Usually they will clear you into Class B and hand you off to SFO tower (120.5). If they refuse, it's time, again, to request a transition at 3500. As long as there are no clouds, this will just about always be granted. They'll clear you into Class B and climb you to 3500 or 4000. This can always be complicated by heavy departures from SFO 28. 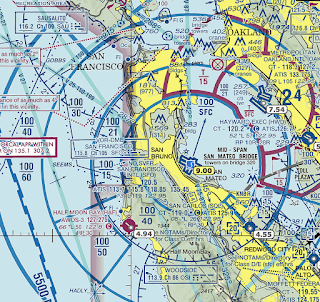 Sometimes, SFO tower will have you fly circles over the stadium at Candlestick Park (currently - stadiums change owners fairly frequently), or right 360s just before San Bruno mountain. If you're at 3500 you may get heading changes to keep clear of this traffic. It's always very impressive to have a 747 or, lately, an Airbus 380 taking off practically across your nose. Whichever altitude you choose, you'll be told to stay south and west of the Bayshore Freeway (maybe overhead 280 if you're higher). You potter down past the airport, watching the heavies come in from Asia and Europe and counting the 380s on the ground. Once you're getting close to the San Mateo bridge, you'll be handed off to San Carlos (if low) or 135.65 (if high). And then the excitement is over. An alternative route is to cross the Bay, staying north of the Bay Bridge, and then transition overhead Oakland. Sometimes you'll be given this, though it's always worth asking about the 3500 foot transition. In this case you'll start by talking to Oakland north tower, then handed off to south tower (the airliner part of what is really two separate airports that share only a name). They'll take you overhead the 30 numbers at 2000, before descending to 1400 to fly down the Bay staying well clear of SFO's Class B.
I've flown this route, or variants of it, over 50 times, and it is always a pleasure, and always a little different. And that's not to mention the few times I did it in the helicopter, overhead the city at 1000 feet and 50 knots and even once under the Golden Gate bridge, which believe it or not is perfectly legal in a helicopter.